Performers include: Jonathan Banks, Jim Byrnes, Ken Wahl, William Russ, Dwight Koss, Patti D’Arbanville, Elsa Raven, Ray Sharkey, Joan Severance, Ken Jenkins, and Kevin Spacey. FBI Agent Vinnie Terranova (Ken Wahl) has just been released from Newark State Penitentiary where he’s been serving an 18-month-sentence to make his cover story as a thug a legit one. Because of his time behind bars, he’s not currently on speaking terms with his mother, but in order to gain access to criminal organizations, his time served was necessary. Working with the Organized Crime Bureau (OCB), Vinnie is tasked with gaining access to criminal organizations and then obliterating them from the inside out and in the end, bringing the participating individuals to justice. Issuing Vinnie his assignments is superior officer Frank McPike (Jonathan Banks). Since Frank is a known law enforcement officer, he must arrest Vinnie for false charges in order not to blow Vinnie’s “wise guy” cover when meeting up to give him a new case. Vinnie’s other contact with OCB, Daniel “Lifeguard” Burrows (Jim Byrnes), updates Vinnie on his cases while his own brother, Father Pete Terranova (Gerald Anthony) gives him updates on all things Terranova. 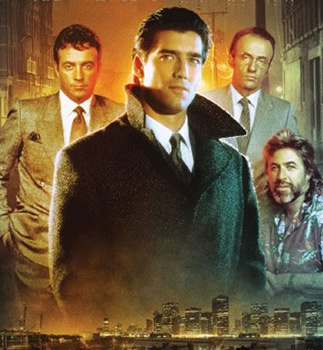 When Vinnie is first thrust into the OCB, he feels as if he’s not ready to take on a case just yet but, when his mentor Stan Dermott (Leon Pownall) is killed, Vinnie persuades the OCB to let him work on the case to take down the murderer, Dave Steelgrave (Gianni Russo). Vinnie must work his way in with the Steelgrave family, especially “boss” Sonny Steelgrave (Ray Sharkey), in order to complete his mission. Once that’s done, Vinnie moves on to take down hitman Roger Loccoco (William Russ) and his bosses, arms dealer Mel Profitt (Kevin Spacey) and his sister Susan (Joan Severence). This action/adventure drama series features multi-episode story arcs and offers viewers in-depth storylines involving the Steelgrave family, white supremacists, the garment trade, and the recording industry.